Hi, I am interested in your 1959 Austin A40 (stock #CJNT051) listed on Autotrader for $17,900. I'd like to get more information about this vehicle and confirm its availability. 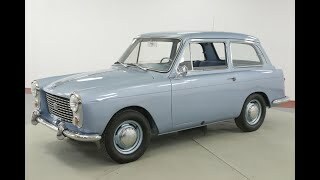 Worldwide Vintage Autos is pleased to present this 1959 AUSTIN A40. $30K+ Restoration recently completed per the previous owner. Only 44 miles since! A number of different automobiles were marketed under the Austin A40 name by Austinbetween 1947 and 1967. 2-door Austin A40 Dorsets and 4-door Austin A40 Devons for the home and export markets, from about 1947 until 1952 Austins naming scheme at that time derived from the approximate engine output, in horsepower. Therefore, the models were also given names, originally based on counties of England.